In a recent surprising result, Korupolu, Plaxton, and Rajaraman [10,11] showed that a simple local search heuristic for the capacitated facility location problem (CFLP) in which the service costs obey the triangle inequality produces a solution in polynomial time which is within a factor of 8 + ε of the value of an optimal solution. By simplifying their analysis, we are able to show that the same heuristic produces a solution which is within a factor of 6(1 + ε) of the value of an optimal solution. Our simplified analysis uses the supermodularity of the cost function of the problem and the integrality of the transshipment polyhedron. Additionally, we consider the variant of the CFLP in which one may open multiple copies of any facility. Using ideas from the analysis of the local search heuristic, we show how to turn any α-approximation algorithm for this variant into one which, at an additional cost of twice the optimum of the standard CFLP, opens at most one additional copy of any facility. 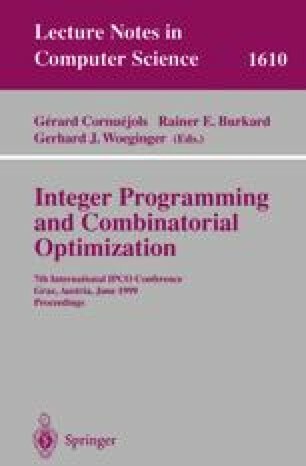 This allows us to transform a recent 3-approximation algorithm of Chudak and Shmoys  that opens many additional copies of facilities into a polynomial-time algorithm which only opens one additional copy and has cost no more than five times the value of the standard CFLP. M. Korupolu, C. Plaxton, and R. Rajaraman. Analysis of a local search heuristic for facility location problems. Technical Report 98-30, DIMACS, June 1998. Available from http://dimacs.rutgers.edu/TechnicalReports/1998.html.